Most of us have a New Year’s resolution. The fact is, we often hit a wall before we achieve it. That’s why this year we say, “have a little fun with it.” If you don’t enjoy the journey, you will only hinder your ability to succeed. So, let’s party. Starting on January 9, you will be invited to join a little New Year’s celebration with RockMyRun. Celebration? Yep! 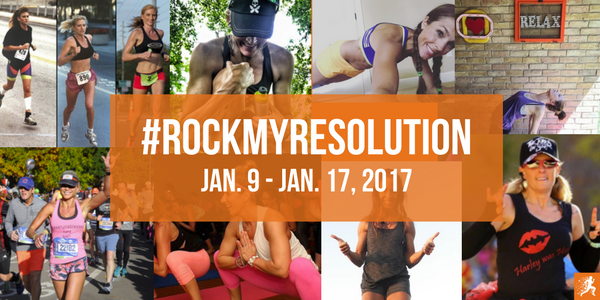 #RockMyResolution is an Instagram-only health & wellness challenge that will make it fun and easy for you to kickstart a happier, healthier 2017. Over nine days, you will have the opportunity to participate in nine simple challenges inspired by people who inspire us. From triathlete Ginny Cataldi to bodybuilder Jenny Grothe, we asked nine health and fitness Instagrammers about their New Year’s resolutions and got some truly thoughtful responses. From these resolutions, we have crafted nine challenges that will not only reward you mentally and physically, but will give you the chance to win our BIGGEST prize ever. When will #RockMyResolution take place? The #RockMyResolution challenge will begin on Monday, January 9 and end on Wednesday, January 18 at 1:00 p.m. PST. What’s #RockMyResolution going to look like? Every day at 1:00 p.m., a new challenge will be posted to the RockMyRun Instagram page. Each post will contain challenge instructions based on the New Year’s resolution of an Instagrammer we love. Directions for participation will provided in the caption of each post. Depending on the day’s challenge, you will be asked to like each post, then leave a comment, tag a friend, or upload your own photo to enter using the hashtag #RockMyResolution. If you live in the United States – you can enter! Must be 13 years or older to participate. To enter, follow RockMyRun on Instagram. From there, you must participate in at least one of the nine of the challenges by following the directions listed in the caption the post. You must complete your challenge within 24 hours, or before the next challenge is posted, for your entry to count. 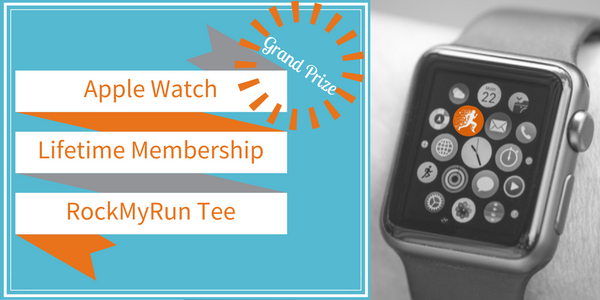 Every time you complete a challenge, you will receive an entry to win a brand new Apple Watch, a lifetime of RockMyRun, and a limited-supply RockMyRun t-shirt! Complete at least one of the nine challenges by following the instructions in the caption of the post(s) you choose to participate in. Each time you complete a challenge within the time permitted, you will get one raffle entry per day of participation (max nine entries). The winner will be randomly selected as part of a final raffle. We will announce the winner publicly on Instagram Monday, January 23, 2017. RockMyRun will reach out to the winner through direct message on Instagram to get the information needed to award your prize. Wanna join? Follow us on Instagram now and get ready for our countdown to Jan. 9! Read here for #RockMyResolution Terms and Conditions.